St. Patrick's Day is an important public holiday in Ireland because it is the symbol of a turning point in the Irish history. Saint Patrick was a Scottish evangelist who converted Ireland to Christianity in the 9th century. During the sermon of the Rock of Cashel, he explained the concept of the Holy Trinity (Father, Son and Holy Spirit) to the Irish with a clover, which thus became the symbol of Ireland. The metaphor of "chasing the sea snakes" comes from the legend that St. Patrick would cast all snakes out of the country. This action symbolizes the conversion of the Irish people to the Christianity, snakes are people who have polytheistic beliefs Celtic Irish of the time. The Irish are very attached to the religion, they made ​​this event a national holiday that they celebrate for several days. Note that if that day is a Sunday, the following Monday is still a holiday. 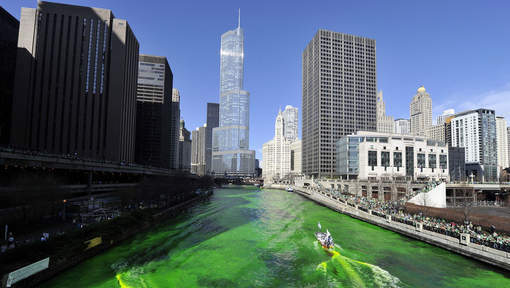 Although this event is specific to Ireland, it is celebrated all around in the world, whether in Canada, Australia, France or the United States where Chicago stands out by coloring its river in green. This year Limerick made ​​every thing big because the 16th March, to celebrate the 44th anniversary of the International Band Championship, it is not less than 1000 musicians that moved. On the 17th March, there were more than 70,000 spectators in the streets for the parade of the St. Patrick's Day.